Christabel Gough, the secretary for the Society for the Architecture of the City and a resident of the Greenwich Village Historic District, has a simple, to the point message for New Yorkers: Beware. Manhattanization, she warns, is growing, encroaching on historical neighborhoods throughout the five boroughs. It is the real estate equivalent of kudzu and Brooklyn, Ms. Gough says, is the next victim. Yet unlike it’s leafy cousin, Manhattanization cannot be eradicated with sheep. But first, a word on Manhattanization, as explained by Ms. Gough in her keynote speech, “Can Cobble Hill Avoid Manhattanization” at the Cobble Hill Association General Meeting on May 29th, and helpfully reprinted at Brownstoner. Ms. Gough is not the only Manhattanite concerned about this growing penchant for historical facelifts. “Many buyers re-entering the real estate market after years on the sidelines are discovering what they’re after in brownstone Brooklyn,” The New York Times’ Marc Santora recently wrote. 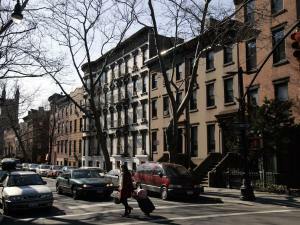 The article, entitled “Brooklyn’s Gold Rush,” lists Brooklyn’s Fort Greene, Park Slope, Boerum Hill, and Red Hook as the most endangered neighborhoods. But they also signify space. “The current frenzy in the brownstone market is more a reflection of the continuing demand for large spaces,” Mr. Santora writes, and developers are increasingly snatching up two- and three-family homes and converting them into larger single-family residences. As a result, the median sales prices of Brooklyn homes, once a much-welcome alternative to their pricier counterparts across the East River, have increased considerably. In Park Slope, median sales prices have jumped from $1.2 million to $1.45 million in the last year (a roughly 20 percent increase); in Boerum Hill, they’re up from $1.1 million to $1.7 million (a 60 percent increase); and in Red Hook, from $475,000 to $825,000 (a 73 percent increase). Not since On the Waterfront has Red Hook been so popular.